Red and Grey Drum Lamp Shade with Spider Assembly Match your favorite dark decor with the red and grey drum lamp shade. 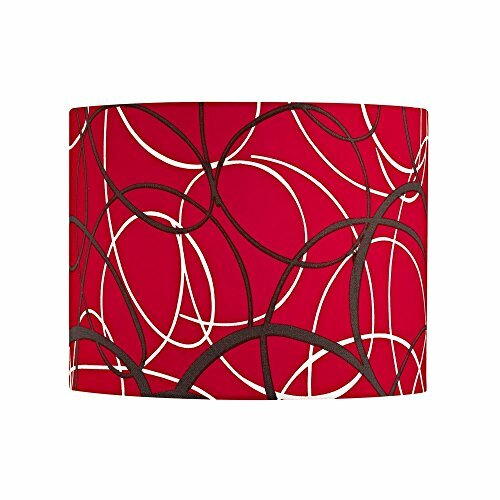 Perfect for the masculine bedroom or the contemporary woman's power office, this drum shade is This drum shade is 13-inches wide and is 10-inches tall and is decorated with a red, black and grey swirl pattern. It has a standard spider assembly, which is three spokes attached to a ring and an adjustable metal harp. The spider assembly is powder coated white to match the shade. This piece is from Design Classics Lighting.. Design Classics Red & Grey Drum Lamp Shade w/ Spider Assembly.